Strange as it may seem, by all indications the loss of the Boston Celtics to the Miami Heat in this years playoffs mean the likely end to one the greats to ever play the game. We may likely never see Shaquille O'Neal on the hard court again. 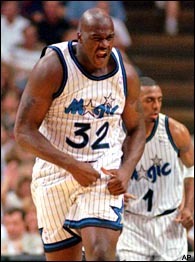 Once one of the most dominant centers in the game, O'Neal started off after being drafted by the Orlando Magic in 1992. His sheer size, not just height but width, was freakish compared to other big men in the history of the NBA. His play, dominating the boards, helped lead the Magic from a literal Mickey Mouse organization into prominence as they reached the 1995 NBA Finals where they were swept by the Houston Rockets. He left Orlando in 1996 to join the Los Angeles Lakers where he and a young Kobe Bryant formed an unstopped team when combined with Phil Jackson, the former coach of one Michael Jordan. Given some maturity and time to grow for all parts and parties involved in the team, the group would go on to win championships in 2000-2001-2002. Winning in the city of stars only made Shaq even more well known. His huge personality and the spotlight of LA helped make Shaq one of the most noticeable faces on the planet. It helped him that during his peak the NBA was going through growing pains, trying to find a new face of the league while people like Bird, Jordan, Johnson all left and perceived "thugs" like Allen Iverson grabbed the spot light. The league became Shaq's playground. In 2004, after losing in the 2004 Finals to the Detroit Pistons, Shaq forced his way off of the Lakers as things between he and Kobe went sour. He joined the Miami Heat in a trade that saw him team with a young up and comer in Dwayne Wade. It didn't take long for the two to make magic happen as they hoisted the Larry O'Brien in 2006, Shaq's fourth championship. It was also that season that the injuries began to take their toll on the 7'1", 320+ lbs frame. After that season Shaq was never quite the same. In 2008 he was shipped to the Phoenix Suns, where he spent a year in essentially limbo as an odd part in the fast paced offense of coach Mark D'Antoni. He was a square peg trying to fit into a round hole as his body began to further go. Some nights he would be his old dominant self. Other nights he would struggle to register as a blip on the radar. It was just an odd fit and he soon found his way out. It was then he found what seemed to be the best chance at ring number five. He was traded to the Cleveland Cavaliers, to be the Robin to the Batman that is the "King", Lebron James. While his goal as stated was to "Win a Ring for the King" things never quite worked out in Cleveland. A thumb injury and surgery sidelined him for most of the season. When he was in the game he was registering career lows in all major categories. It was clear things were coming to an end, and he knew that. It was likely why he decided to take one last stab, signing a one year deal with the Boston Celtics, themselves an aging group with perhaps one last chance at winning a championship. He unintentionally became the mascot of the Celtics, the aging hopefuls that were hanging on for one more chance. Unfortunately for him it wasn't meant to be. His legacy is likely left at four rings, one shy of a full hand. The larger than life O'Neal was hampered in the last few years by a body that just wouldn't quite keep up with the desire. Calves, Achilles tendons, and other ailments kept the big man from competing in a full season for the past three years. His likely retirement signals the end of an era. It was an awkward era of transition. O'Neal was the super star that bridged the gap between Jordan and James. While his smile will graces cameras again, his like may never be seen on the court again.